There seems to be so many unpleasant things going on in the world today, that nothing makes me happier (on a Monday morning) then telling you about a whole lot of good! And all because of one man. Justin Hackworth. Have you heard of him? If not, allow me to introduce you. You might just fall in love. Not that kind of love, the kind your husband will allow (at least mine does anyway). Justin and I spend time together, though I'm not sure he's aware of it. I browse his photography blog almost daily. The images are SO REAL. He captures life and happiness, personalities and emotion. The photos are simple and timeless. The ones you want plastered all over every wall of your home. He recently took on a huge project. 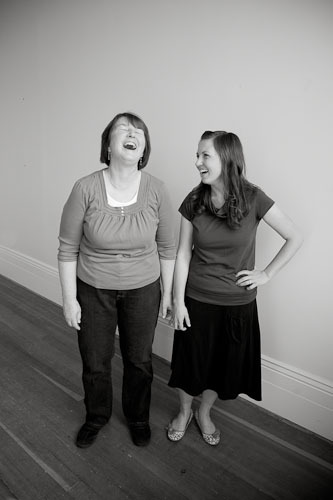 30 strangers II: Mothers and Daughters. I tried with all my powers that be (which must not be very strong since it didn't work out) to make it to Utah to be a part of his project. 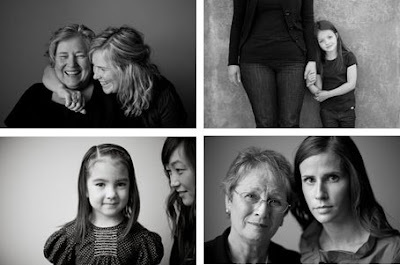 He photographed 30 different sets of mothers/daughters that he had never met before in 30 days. During those 30 days he wasn't paid his normal portrait fee, instead those who participated made a $25 donation to the Center for Women and Children in Crisis, which is the women's shelter in Provo, Utah. On July 2nd (get out your calendars ladies) Justin is holding an exhibit to showcase the images from this project. And in doing so he is extending the fund raising efforts. On the night of the exhibit anyone (that means YOU) that would like to make a $25 donation to the center can for free, schedule their own mother/daughter portrait session for anytime between July - September. This is an amazing deal AND you are contributing to a wonderful cause, double bonus! You don't want to miss this! Read more information here. And just for fun.. can you spot (in the photos from the project)? Now Go! and be a part of something big.. and good.. you'll be glad you did.